Hofstra Career Center: Looking for a Rewarding Career? Hear us out! Looking for a Rewarding Career? Hear us out! My name is Emily, and I would like to inform you about the Department of Speech-Language Hearing Science’s upcoming Career Day on February 26th. 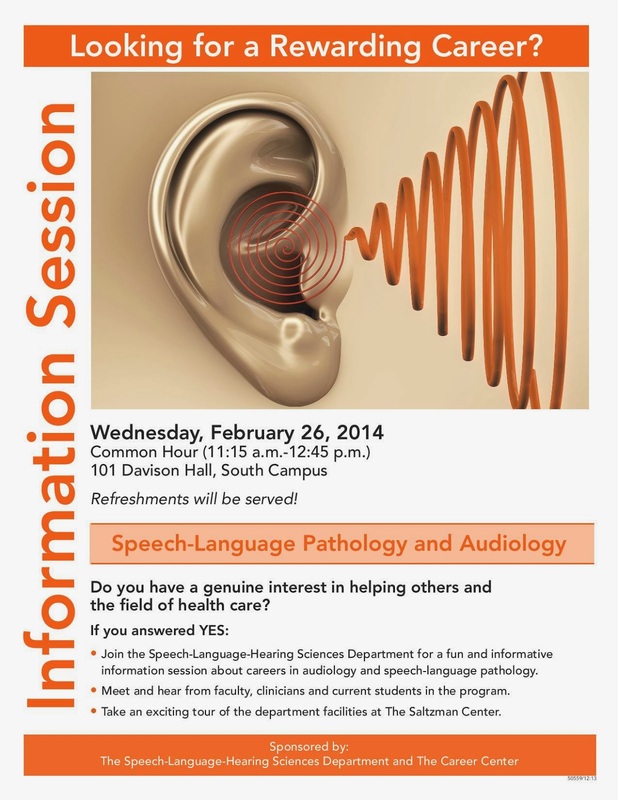 Our very own Professor, Dr. Milstein, is hosting this wonderful event in order to invite students who are undecided or unhappy with their major to explore the numerous career opportunities as a Speech-Language Pathologist or Audiologist that can develop from being a Speech-Language-Hearing Sciences major. This event gives you the opportunities to not only ask questions, but also to learn about our undergraduate student organization, NSSLHA. This club allows you to not only to further explore the major but also to make lifelong friends. When I first came to Hofstra, I was completely lost. I had no idea what I wanted to do, or how to even approach finding a major. Once I was advised to visit the Speech-Language-Hearing Sciences Department, I instantly fell in love. The staff who comprises the department are all wonderful individuals who truly care about your well being, and actually take the time out to help advise and encourage you, not only within the major but with your academic career. My favorite aspect of the major is how you can work with children one on one or in a small group setting, allowing you to create a special bond. In addition, you have the opportunity to become an advocate to increase a person’s quality of life. In addition, your fellow classmates not only support you in your studies, but also give great advice and truly become your best friends. I realized this when I joined NSSLHA. NSSHLA allows you to socialize with your peers outside of the classroom. It is a priceless opportunity since everyone is having similar academic stresses. I do not know where I would be today without these priceless companions. Also, the executive board along with me dedicates our time to organize events that allow you to become even more involved in the major and the community that surrounds it. I hope to see anyone who is interested in becoming a Speech-Language-Hearing Sciences Major on Wednesday, February 26, in Davison Hall Room 101, during Common Hour (11:15am – 12:45pm)!